"When I decided to get married at 40, I couldn't find a dress with the modernity or sophistication I wanted. That's when I saw the opportunity for a wedding gown business." We are nearing the summit of peak wedding season. The average amount spent on a wedding dress is well over a grand and a Marchesa gown retails for close to $6,000 on net-a-porter.com. Quite a contrast from today's standards, brides-to-be in the 1940s had bigger concerns weighing on their minds than what type of cake they would eat or who would photograph their wedding. Many just hoped their fiancé would return home safely from the war. War rations directly impacted fashion in the 1940s. Wool and cotton were commandeered for uniforms and other military supplies while silk and nylon were needed for parachutes. Hemlines rose and swimsuit necklines plunged as designers consciously stuck to war limitations, which led to saving fifteen million yards of fabric. Vogue reported this figure in May 1943 while giving its approval of "The Narrow Look." Those engaged to be married didn't have the luxury of popping by a shop and choosing a wedding dress consisting of silk, lace, and tulle. If they were lucky, a parachute might blow their way . . . In 1944, Major Claude Hensinger, was returning with his crew from a bombing raid over Yowata, Japan, when his engine caught fire. Major Hensinger clung to the parachute that saved his life and later gave it to his girlfriend Ruth to use for her wedding gown when he proposed. 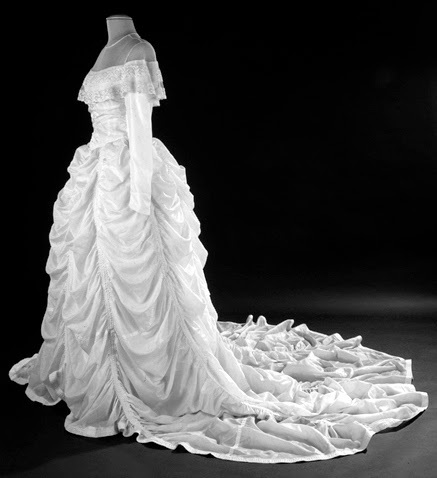 Ruth wanted her dress to resemble Vivien Leigh's in Gone with the Wind. 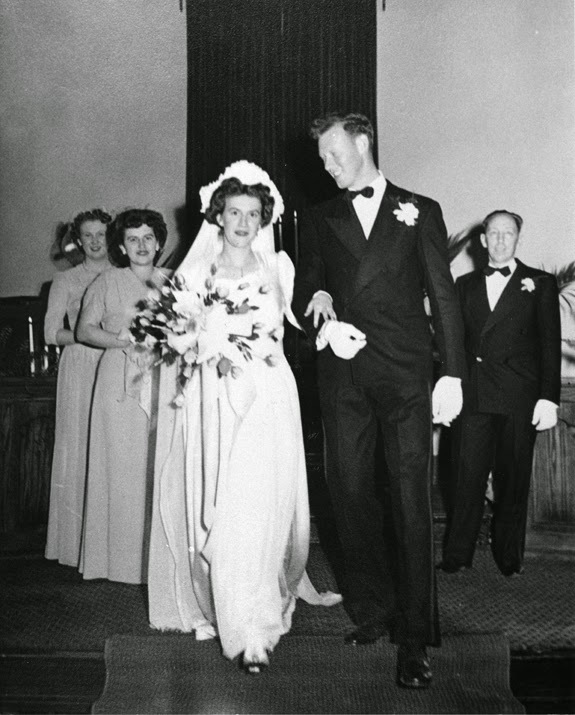 She hired a seamstress to complete the look and became Mrs. Hensinger on July 19, 1947. Ruth signed over her dress to the Smithsonian in the 1990s. Joyce Adney and Adrien Reynolds's story was not much different than the Hensingers'. According to the National WWII Museum of New Orleans, Mr. Reynolds and his fellow Marines stumbled upon several unused Japanese parachutes while clearing out some caves in 1944. He sent one of the parachutes back to his bride-to-be Joyce for safekeeping. Just as many other brides did at the time, Joyce also had her wedding dress constructed out of parachute silk. Her mother, a seamstress who lived in another state, had Joyce measure her bust and waist using strings. She then mailed the strings to her mother to use as guides in sewing the dress for her big day. Although Joyce didn't have the opportunity to try on a multitude of Vera Wang and Marchesa dresses, the future Mrs. Reynolds would have quite a story to tell. I didn't make a wedding dress, but I did incorporate two white parachute buckles into my latest design. The jacket and shorts are made out of a blue organic twill from Mood Fabrics. I included square cap sleeves and two belts (made out of the same twill fabric) and attached the parachute buckles. I also made a pair of matching high-waisted shorts to complete the look. This summer shorts suit may not have a romantic war-related backstory, but I'm just happy I didn't have to wait for a parachute to fall from the sky to make it with.